The young matador gored the old bull as New Zealand's exciting young heavyweight boxer Joseph Parker stopped Australian-based veteran Kali Meehan inside three rounds at Trusts Stadium on Thursday. The superior hand and foot speed of 23-year-old Parker enabled him to dominate against his vastly more experienced opponent. After a quiet start world ranked Parker unloaded in the back half of the first round in Auckland, the city in which both men were born. Meehan landed the odd blow but was fighting mostly off the back foot. He needed all of his 18 years of professional experience to survive the second round as it ended with the local fighter furiously pounding Meehan. It was the briefest of reprieves as Parker brutality ended the contest in the third with a quickfire left-right combination flooring his opponent. The referee waved the bout off before completing the count and Parker won the five regional belts on offer for the winner. Parker's victory lifted his record to 16-0, 14 KOs. NSW central coast based Meehan's record dropped to 42-6. It was his first loss in ten professional fights in Auckland. Meehan said Parker possessed good power and fast hands and he couldn't catch him with the shots he needed. "I was looking to get him into some power shots but he was good," Meehan said. "I found I could make him miss, I thought I was having some success there. "I was looking for a counterpunch, then he got me with a couple of hundred lucky ones!" Meehan suggested he could consider retiring - but said he still had a TV contract for one more fight. Parker paid Meehan respect for his achievements. "I used to watch him when I was younger and I have a lot of respect for Kali," Parker said. "But I believe it's our time now." Earlier, Brisbane's world ranked welterweight Jeff Horn (12-0-1, 8 KOs) scored a unanimous 10 round points decision over Argentinian Alfredo Blanco in a fight for four regional titles. 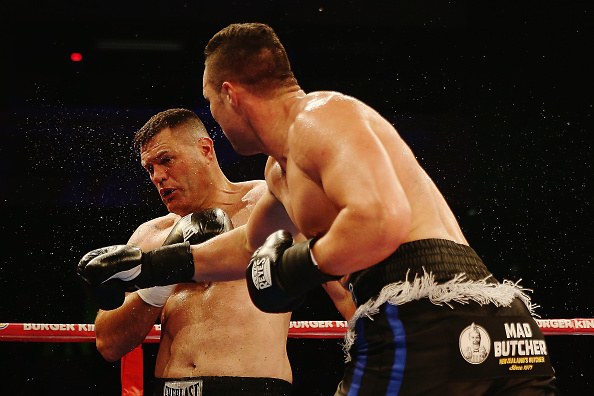 Meehan's son and fellow heavyweight and former Sydney Roosters rugby league player, Willis Meehan (4-0, 3 KOs), stopped Leamy Tato in the second round.